is not just forgivable but a sign of superior morality. AUSTRALIA’s Great Barrier Reef, all-too-often garners the attention of the mainstream media for all the wrong reasons. It has long been a favoured icon of the $2,000,000,000,000 US per year (2 Trillion) Climate Crisis Industry used to push their draconian, CO2 Climate Change agenda. How dare we actually get to enjoy the Reef’s overwhelming pristine beauty! An estimated 175,000 fewer tourists could visit Australia if the bleaching persists and worse if the [claimed] damage becomes permanent. The polls, which surveyed the attitudes and awareness of 1000 people in each market, found potential visitors were concerned over the state of the reef, which in turn could feed into them deciding to visit other Australian attractions or to go to places other than Australia entirely. The finding suggests the tourism businesses and related local economies adjacent to the Great Barrier Reef, could suffer the loss of 10,000 jobs and that the Australian economy could lose as much as $1 billion per year in overseas income. The reef supports an estimated 70,000 jobs in the tourism and related sectors and accounts for a significant proportion of Australia’s tourist income. COCKATOO REEF is a piece of the reef that the climate change zealots haven’t yet spoiled with a government grant or a pal-reviewed acid-attack. And is yet to be sullied by the panicked-pen of Sydney Morning Herald’s climate catastrophist-in-chief Peter Hannam. SO, enjoy the Cockatoo blue hole in all its glory, before it’s put on the threatened species list by the CO2-centrics and mainstream media hacktivists. Johnny Gaskell’s fascination with the blue holes of the Great Barrier Reef began when he was hunched over his computer one night in 2017. The marine biologist, tasked with finding coral colonies that might have escaped the ravages of Cyclone Debbie, was poring over satellite images on Google Maps when he noticed a weird anomaly — a circular indigo spot — in Cockatoo Reef, part of the remote Pompey Complex 200km off Mackay. All he could find about it online was a 1979 scientific paper that confirmed it was a marine sinkhole (you’ll have seen pictures of terrestrial versions, swallowing up entire houses) and one of a handful in the Great Barrier Reef. It gave Gaskell an idea: might these deep holes, protected from storms, harbour undamaged coral? His first exploratory trip, to a blue hole near his base on Daydream Island in the Whitsundays, confirmed this hunch. And not only was the coral pristine, it was unlike anything he’d seen before: over decades in the 30m-deep, perfectly still water it had developed “very delicate, elongated, spindly branches” that looked like abstract sculptures. He found himself wondering, Why aren’t these blue holes better known? Last November, the answer became clear when he finally made it out to the Pompey Complex to dive the Cockatoo Reef blue hole and two others. A 12-hour boat trip offshore, it’s a treacherous area: huge tides race through the reef channels, and even modern charts mark sections as “Unsurveyed”. Gaskell, 37, had to wait for slack water during a neap tide to thread his tender through Cockatoo Reef to its 220m-wide blue hole, a little oasis of perfect calm. He snapped this shot with a drone. Such adventures are a far cry from his childhood in central Victoria, studying critters that he’d scoop out of creeks with a jam jar. Next winter he’s planning to visit another, unnamed blue hole hinted at in that 1979 paper — the most remote and mysterious one yet. “Legend has it it’s 70m deep,” he says. What does he expect to find? “Who knows? Big sharks,” he laughs. 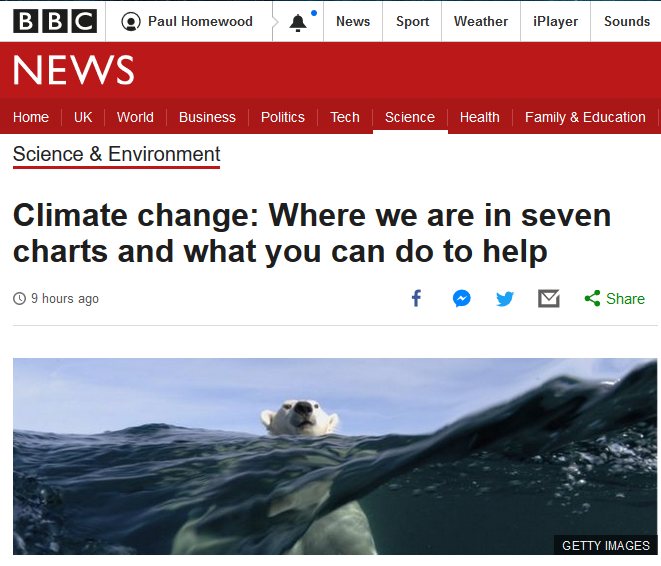 BRUTAL and comprehensive rebuttal by Paul Homewood to the latest climate agitprop out of the taxpayer funded BBC, released in time to further pollute the minds of their readers as they focus on the UN COP24 climate junket in Katowice, Poland. Representatives from nearly 200 countries are gathering in Poland for talks on climate change – aimed at breathing new life into the Paris Agreement. The UN has warned the 2015 Paris accord’s goal of limiting global warming to “well below 2C above pre-industrial levels” is in danger because major economies, including the US and the EU, are falling short of their pledges. But scientists at the Intergovernmental Panel on Climate Change (IPCC) – the leading international body on global warming – last month argued the 2C Paris pledge didn’t go far enough. The global average temperature rise actually needed to be kept below 1.5C, they said. NAT Geo pops up again with another blatant falsehood designed to deceive its audience. 100+ years building a publication of reputation and integrity only to have it destroyed in as little as a decade thanks to a religious zeal to the doctrine of CAGW. REAFFIRMS the old adage that reputation takes a long time to build but can be destroyed overnight. RIP Nat Geo. Viva La Polar Bears! Inconvenient rebound in polar bear numbers. One of the people who oversees an Indigenous hunt of polar bears says the population is doing well, despite heart-wrenching photos online suggesting some bears are starving. Every year, the Nunatsiavut government awards polar bear licences to Inuit hunters living in the northern Labrador settlement area. The Inuit set a quota of 12 polar bears this winter. Nunatsiavut wildlife manager Jim Goudie said all 12 were taken within the first seven days of the season. Goudie said it’s just the latest evidence that polar bears are on the rebound in northern Canada — a trend he said officials have been recording for years. IT hasn’t been the best start to the year for the global warming doom industry. Three consecutive “Beast From The East’s“ caused by super-cold Arctic air have resulted in 48,000 non-heat related deaths in the UK alone, as the 2017/18 Northern Hemisphere mega-winter rages on, well into spring. THE ‘extreme’ cold has seen Iguanas frozen solid in Florida, alligators in a state of cryogenic freeze, sharks washed up in Cape Cod “stranded due to cold shock”, the coldest Super Bowl on record, Niagara Falls frozen over, a thermometer in the world’s coldest village breaking as temperatures plunge to -62C, the lowest temperature ever recorded in Bangladesh, frozen crops creating a food crisis in Europe, even a mass die-off of sea creatures as UK ocean temps plunged 1-3 degrees centigrade, cold temperatures smashed across Saskatchewan’s central and south regions in the spring of April, and the list of non-heat ‘extremes’ goes on. RECORD cold temperatures have dumped unprecedented amounts of the white fluffy stuff that was, by now, meant to be “a very rare and exciting event”, something that “Children just aren’t going to know what (snow) is”. Dr Viner’s “thing of the past” covered all 50 states in North America, with rare falls experienced in Rome, Monaco, the Sahara desert and the first snow in 50 years dusting Southern Morocco. And, it’s been a rough old winter for Gavin Schmidt’s NASA GISS Temp New York office – home of the “Hottest Year(s) Evah” sausage factory – with the city that never sleeps experiencing its “fifth consecutive season that at least 30 inches of snow has fallen” with CNN reporting “It’s official: NYC hasn’t seen snow like this in 130 years“! DON’T LOOK THERE, LOOK HERE! 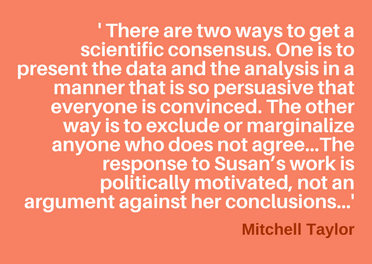 ERICA Goode’s unhinged attack on Dr. Crockford in the NY Times is further evidence of the totalitarian and authoritarian underpinnings that have corrupted the field of climate ‘science’. – Question the preferred wisdom of the day at your own peril! – Obey, or be persecuted and have your reputation trashed! This isn’t science, this is religion. “Belief” and “Denial” are the words of zealots, not scientists. WHAT would it take for activists Goode and Co. to be happy? A Polar Bear population back to 1960’s extinction levels? Sadly, I believe the answer is yes! How dare their scared ‘cow’ and mascot of climate catastrophe have grown in population from some 5,000 in the 1960’s to 25,000-30,000 at present, despite rising CO2 and diminished sea-ice extent? INCREASING polar bear numbers, directly threaten the power of activists and their lucrative climate change scare. We can’t have that now can we Erica? SPOTLIGHT: Journalistic professionalism evaporates in front of our eyes. BIG PICTURE: When historians document the demise of the mainstream media, an article published this week by the New York Times will make an excellent case study. Titled “Climate Change Denialists Say Polar Bears Are Fine. Scientists Are Pushing Back,” it’s written by Erica Goode who isn’t just any journalist. She’s a former Environment Editor of the Times. In 2009, she “founded and led a cluster of reporters dedicated to environmental reporting.” Currently, she’s a visiting professor at Syracuse University. Out here in the real world, a debate exists about polar bears. Will they be adversely affected by climate change or will they continue to adapt as they have historically? NICKNAMED “The Gray Lady“, The New York Times has long been regarded within the industry as a national “newspaper of record”. IN March the paper launched a series called Warming Planet, Vanishing Heritage which examines “how climate change is erasing cultural identity around the world.” The series based on a UN “World Heritage and Tourism in a Changing Climate“ report, designed to push the fashionable theme that your lifestyle is causing imminent danger to ancient monuments by dangerous sea-level rise and other climatic horrors.